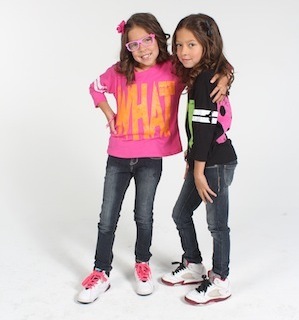 Flow-Pops is a Hip-Hop/Pop group consisting of 3 members – Shawn, AnaLisa and Marie Griffin. They are a father and daughter trio, that have been performing together since 9-year-old twins AnaLisa and Marie were only 4 years old. With the response they received performing at such a young age, they knew they had something special. With Shawn writing music and rapping, along with AnaLisa’s and Marie’s voices, they are definitely rising stars. This unique group’s style is for adults and kids alike, and guaranteed to entertain and leave a lasting musical impression. Not only is this group meant for the limelight, they also use their talents to reach the inner-cities through various rallies and campaigns. Their first 2 singles ‘Sound Of Music’ and ‘Tomorrow’ can be found on iTunes, Amazon mp3, and the Google Play Store. You can also check them out at Flow-Pops.com and Facebook to see what this group is up to. Please play more of the Flow Pops. I love them and my little brothers love to sing along. I love the Flow Pops! They are awesome! I would love to hear them more often on ur station. They are great for kids and adults. Their performance and singing ability is very promising for a great future. They touch my heart each time I hear them. We saw their performance at the mall, love loved them, please play their songs on JENNiRADIO.